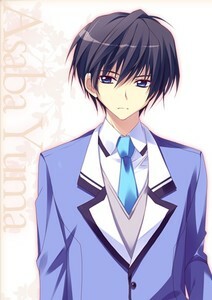 Yuuma is a second-year at Mihaya High-school and sort of a celebrity on campus. In spite of being rather blunt, he’s a person that deeply cares for others. He simply can’t leave troubled people alone when he sees them. Being a Sanitary Committee Member, he’s helping out at the school infirmary during breaks and after school. His work there includes listening to the love troubles of girls and offering them his advice. However, that eventually led to him becoming the focus of romantic interests. At school, he’s known as the “Wanted Guy” with a reward money of 21000 Yen (before tax) for successfully capturing him. The reward money goes up considerably as days passed much to his annoyance.